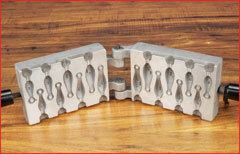 Li’l Mac A-Series Molds are self-locking, no vise or other clamps needed. 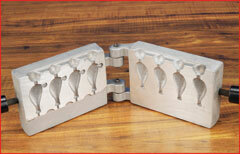 Clip lock comes with each mold! Free standing, no stand or bracket needed. 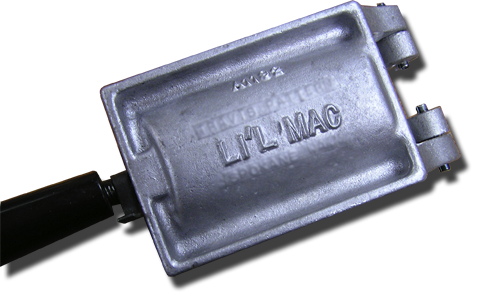 Li’l Mac molds come equipped with large hinges to provide easy opening, and machined surfaces to eliminate flash. 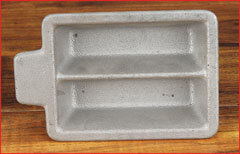 These molds require little to no clean-up or trimming. Choice of the fisherman because of its precision and quality. Also the choice of the production caster because of its durability. No matter where you fish- North, South, East, or West – we have a variety of products to help you make your own money-saving sinkers and jigs for just pennies a piece. All sinkers have eyes cast in and are used for all types of fishing. 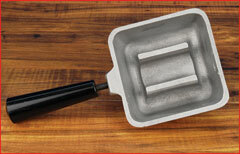 Three sided sinker with greater flat surface area to keep the sinker from rolling. 206000 A-600 2 ea. 1/2 oz. No. 5 Nickel Barrel Swivel, No. 6 Bead Chain, M-1 Brass Eyelets. 206010 A-601 2 ea. 1 oz. No. 5 Nickel Barrel Swivel, No. 6 Bead Chain, A-601 Brass Wire Form. 206020 A-602 2 ea. 2 oz. No. 5 Nickel Barrel Swivel, No. 6 Bead Chain, A-602 Brass Wire Form. 206030 A-603 2 ea. 3 oz. No. 3 Nickel Barrel Swivel, No. 10 Bead Chain, A-603 Brass Wire Form. 206040 A-604 2 ea. 4 oz. No. 3 Nickel Barrel Swivel, No. 10 Bead Chain, A-604 Brass Wire Form. 206050 A-605 2 ea. 5 oz. No. 1 Nickel Barrel Swivel, No. 10 Bead Chain, A-605 Brass Wire Form. 206060 A-606 2 ea. 6 oz. No. 1 Nickel Barrel Swivel, No. 10 Bead Chain, A-606 Brass Wire Form. 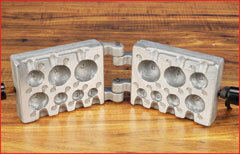 All molds accommodate M-1 small eyelets, but eyelets can be let out for use with surgical tubing. When eyelet is cast in lead, the lead can be bent over or clenched over fishing line. Sinker is excellent in rocky bottom waters. With a bend in the sinker, it will tend to plane upwards away from hazards. Used mostly on jetties for perch and sea bass. General purpose sinker with swivel to make changing weights easy. Two eyelets can be cast in to make it an in-line sinker. Smash it in a vise or hit with hammer and it will resemble a cod sinker for bottom fishing. Weight size is cast in the sinker. Self stores string and will fit over decoy's head or cut and bend around neck. Shipping weight 3 1/4 lbs. 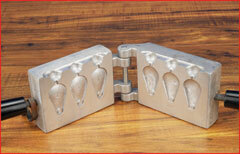 Many sportsmen make their own sinkers and jigs because they frequently have the need for molds not available. 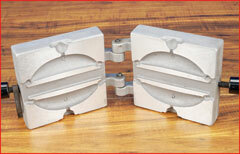 Tool and die shops have capabilities of tooling cavities to the customers satisfaction. 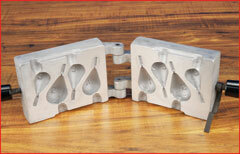 For this purpose we offer a totally blank mold which is the same size as our regular molds. 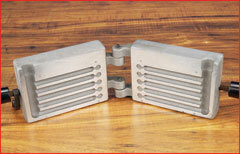 Tooling for even simple designs can be expensive and the cost of a complicated design might be hard to justify. 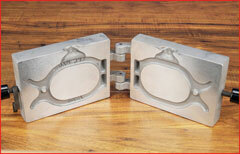 It would be wise to get a tooling cost estimate before ordering a blank mold. 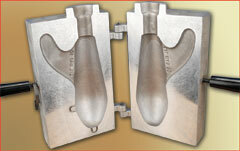 However, tooling your own "secret weapon" in our blank mold is far less expensive than having a custom mold made. 215000 A 1-5 1 ea. up to 5 lbs. Makes diving weights with belt slots from 1 to 5 lbs. 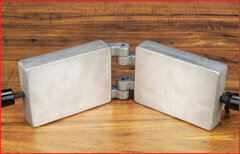 A single cavity mold that requires only one integral wire form insert (3/32" Brass). Heavy duty constuction of cast aluminum. DR-2 uses M-3 brass eyelets. 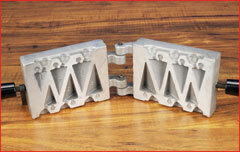 DRW-00 Wire Form fits DR-7 and DR-4 molds. © 2011 Li'L Mac Molds. All Rights Reserved..